Received December 16, 2017; Revised April 12, 2018; Accepted June 4, 2018. The patients receiving hematopoietic stem cell transplantation (HSCT) are known to have a high incidence of breakthrough nausea and vomiting due to the conditioning regimen. 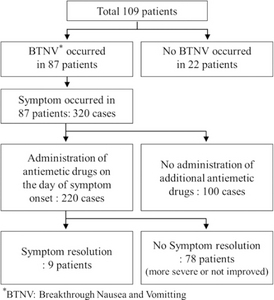 The purpose of this study was to evaluate the adequacy of antiemetic therapy for breakthrough nausea and vomiting in patients receiving HSCT and to propose an effective treatment regimen. We retrospectively reviewed the electronic medical records of 109 adult patients. The collected data were used to identify (1) antiemetic and dosing regimens prescribed for controlling breakthrough nausea and vomiting, (2) the rate of patients who developed breakthrough nausea and vomiting, and (3) the percent of antiemetics prescribed on the day of symptom onset. Based on the National Comprehensive Cancer Network guideline, we assessed the suitability of antiemetics for breakthrough nausea and vomiting, and prescription timing. All patients were prescribed pro re nata antiemetics. About 40.0%, 41.4%, and 18.6% of patients were using one, two, and three or more additional drugs for breakthrough nausea and vomiting, respectively. The most frequently administered drugs were intravenous metoclopramide (43.8%) and granisetron patch (36.2%). Breakthrough nausea and vomiting occurred in 87 patients (79.1%) and they developed symptoms 320 cases. About 220 cases (68.8%) were treated with additional antiemetics on the day of symptom onset and the rate of symptom resolution was only 10.3% (9 patients). The breakthrough nausea and vomiting in patients receiving HSCT occurred very frequently and was hard to control, thus requiring more rapid and aggressive treatments. 조혈모세포 이식 환자들의 경우 Conditioning regimen에 고강도 항암 요법이 포함 되지만 다른 항암 치료 환자들에 비해 추체외로 증상, 과도한 sedation, neutropenia 등의 부작용 발현 위험이 높아 다양한 항구토제의 선택에 제한이 따른다. 9,10) 이에 따라 일반적인 항암제에 의해 유발되는 구역·구토의 치료와는 다르게 접근하여야 하지만 돌발성 구역·구토 치료에 대한 명확한 guideline이 부족한 실정이다. 이에 본 연구에서는 항구토제의 처방 접근성에 대한 적절성 평가를 통해 구역·구토에 대한 증상 호소를 한 당일 항구토제 투약이 이루어질 수 있도록 PRN 오더(as required whenever necessary)가 발행 되었는지를 확인하고자 하였다. 그 다음 항구토제의 투약 현황 파악을 통해 예방적 항구토제와 같은 계열의 약물이 가이드라인과 다르게 중복되어 사용되는 빈도에 대해서 파악하였으며 항구토제 투약 시기 및 치료의 적절성 평가를 통해 PRN 오더(as required whenever necessary)로 환자의 증상 호소 당일 환자에게 실제로 항구토제 투여가 이루어진 빈도와 항구토제 투약으로 돌발성 구역·구토가 해소된 비율을 파악하였다. 이를 통하여 본 논문에서는 조혈모세포 이식 환자들의 돌발성 구역·구토에 따른 항구토제 사용 현황을 파악하고 치료의 적절성을 평가하여 효과적인 돌발성 구역·구토 치료방법을 제시하고자 한다. 본 연구는 지난 2016년 8월 26일 IRB 승인(IRB No. B-1609-361-107)을 받았다. EMR을 이용하여 환자의 기본 정보, 이식 시 시행한 conditioning regimen의 종류, 돌발성 구역·구토 치료를 위해 처방된 약물의 투약 시기, 종류, 처방량 등을 조사하였고 간호의무 기록을 통하여 구역·구토의 정도와 횟수를 파악하여 구역·구토 증상의 조절 여부를 파악하였다. 적절성 평가 항목은 다음과 같다. 항구토제 처방 접근성은 즉시 투약 가능한 처방의 유무로 평가 하였다. 항구토제의 투약 현황을 확인하기 위하여 환자당 돌발성 구역·구토의 치료를 위해 추가로 사용한 약제의 수, 추가로 투약한 항구토제의 종류, 그리고 예방적 항구토제와 같은 계열을 처방한 비율을 조사하였다. 투약 시기 및 치료에 대한 적절성 평가는 돌발성 구역·구토 발생 빈도를 바탕으로 증상 호소 당일의 항구토제 투약 비율과 항구토제 투약 후 구역·구토의 해소 비율 즉 돌발성 구역·구토를 조절하기 위해 투약한 항구토제로 해당 증상이 조절되어 더 이상의 추가적인 투약(rescue medication)이 필요하지 않은 비율로 평가하였다. 해당 기간 내 분당서울대학교병원에서 조혈모세포 이식을 받은 19세 이상의 성인 환자는 113명으로 이중 의무기록의 부족으로 항구토제의 효능을 파악 할 수 없는 환자, 조혈모세포 이식 치료 전부터 구역·구토가 있었던 환자 등 4명이 제외되어 총 109명이 연구에 포함되었으며 환자군의 특성은 다음과 같다(Table 1). 해당 기간 동안 본원에서는 말초혈 조혈모세포 이식만 시행되었다. 즉시 투약이 가능한 처방인 PRN 오더(as required whenever necessary)는 미리 발행되어 있어 환자의 상태에 따라 간호사가 필요 시 의사의 확인 없이 투약이 가능한 처방으로 전체 환자 109명 중 109명(100.0%)에게 발행되어 있었다. 한 환자 당 돌발성 구역·구토 치료를 위해 추가로 사용한 약제 수는 conditioning 기간 중 예방적 항구토 요법에 포함된 약제 외에 추가로 투여된 항구토제의 수로 알아보았다. 예방적 항구토요법으로 conditioning regimen 기간 중 구역, 구토 유발 중등도 위험의 항암제가 투여되는 날은 serotonin antagonist 주사제가 투여되며 항암제 투여 종료 1일, 2일째에는 serotonin antagonist 경구제가 투여되었다. Conditioning regimen 기간 중 구역, 구토 유발 고위험의 항암제가 투여되는 날은 aprepitant 125 mg 경구제와 serotonin antagonist 주사제 그리고 dexamethasone 주사제 12 mg이 투여되며 항암제 투여 종료 1일, 2일째에는 aprepitant 80 mg 경구제가 예방적 항구토제로 투여되었다. 전체 환자의 40.4%(44명/109명)는 1종의 항구토제가 돌발성 구역·구토의 치료를 위해 추가로 투여되었으며, 2종의 경우 41.3%(45명/109명) 그리고 3종 이상의 경우 18.3%(20명/109명)이었다. 전체 환자의 약 59.7%는 2종 이상의 항구토제를 추가로 투여했음을 알 수 있었다(Table 2). 이중, 항구토제별 사용 빈도는 전체 총 처방 건수 416건 중 metoclopramide 정맥 주사제 42.8%(178건/416건), granisetron 패치제 35.3%(147건/416건)를 차지하였고, lorazepam 정맥 주사제, granisetron 경구제가 각각 18.8%(78건/416건), 2.6%(11건/416건)이었으며, olanzapine 경구제 또는 metoclopramide 경구제를 사용한 처방은 각각 0.2%(1건/416건)에 그쳤다(Table 3). Serotonin antagonist계열의 예방적 항구토제와 같은 계열로 항구토제를 중복하여 처방한 비율은 총 158건으로 전체 처방의 38.0%이었다. 전체 환자 109명 중 79.8%(87명)에게서 돌발성 구역·구토가 발생하였으며, 당일 증상 호소 발생 건수 320건 중, 증상을 호소한 당일에 약물이 투약된 비율은 68.8%(220건)이었다. 항구토제 처방으로 구역·구토가 해소되어 추가적인 항구토제의 투약이 필요하지 않았던 환자는 9명으로 전체 구역·구토 발생 환자 87명 중 약 10.3%(9명/109명)에 그쳤다(Fig. 1). 먼저, 다양한 항구토제를 사용하지 못하고 기존 예방적 항구토제로 사용한 약제와 동일한 계열로 중복하여 사용하는 배경에는 국내의 항구토제의 급여 인정 조건이 관련이 있을 것으로 보인다. 조혈모세포 이식 여부, 항암제의 용량, 투여 일수에 대한 고려 없이 항암제 각각의 구역·구토 유발 위험도 중 가장 높은 위험도를 가진 약물을 기준으로 항구토제 급여 기준이 정해지기 때문에 대부분 조혈모세포 이식의 conditioning regimen이 중등도 구역·구토 유발 위험으로 분류되어 serotonin antagonist 주사제 사용이 추천되고, 전처치 요법 기간 중 구토 발생시 serotonin antagonist 경구제나 다른 성분의 항구토제(경구제, 주사제 포함)의 투여에도 조절되지 않는 경우, serotonin antagonist 주사제를 허가사항을 초과하여 추가 투여할 수 있는 것으로 되어있다. 이에 따라 본원 뿐만 아니라 국내 조혈모세포 이식을 진행하는 병원에서도 돌발성 구역·구토에 대해서 serotonin antagonist 계열 외의 다양한 약제를 투여하기 쉽지 않은 상황이다. 또한 연구 결과에서 granisetron 패치제가 빈번하게 추가 사용되는데 이는 granisetron 패치제가 돌발성 구역·구토를 치료하기 위한 약제는 아니지만, 투여 경로를 바꾸어 추가적인 항구토 효과를 기대 할 수 있고 한 번 처방하면 5일 동안 지속되기 때문에 투약의 편의성이 높아 처방의 빈도가 높은 것으로 파악된다. 하지만 예방적 항구토제로 주사제과 경구제의 serotonin antagonist 계열이가 이미 투여되고 있음에도 상기 약품이 투여되는 것은 계열 중첩이라는 점에서 효과적인 치료가 되지 못하며 이는 NCCN guideline과도 다른 치료 방법으로 판단된다. 그리고 PRN 오더가 있음에도 실제 항구토제 투약으로 이어진 빈도가 높지 않은 것은 실제로는 예방적 항구토제가 이미 투여가 된 상황이어서 돌발성 구역·구토가 발생하여도 추가적으로 항구토제를 투여하는 것을 적극적으로 고려하지 않았기 때문으로 판단된다. 또한 실제로 투약이 이루어지지 않은 환자들의 구역·구토 증상이 투약이 된 환자들보다 약했을 가능성이 있다. 그리고 의료진들이 환자들의 호소에 대해서 투약이 필요하다고 판단하지 않은 점도 투약의 빈도가 높지 않은 이유 중 하나 일 것이다. 일본에서 이루어진 돌발성 구역·구토에 대한 보고에 따르면 증상은 있으나 rescue medication의 투약이 이루어지지 않은 경우에 대한 이유를 증상이 심하지 않아서, 의료진들이 인지하지 못함 그리고 환자들이 적극적으로 증상을 말하지 않는 것을 주요한 이유로 들고 있다. 16,17) 구역·구토가 심한 경우 한 환자에게 추가로 3종 이상도 투여가 되지만 추가로 투여되는 항구토제가 주로 같은 계열의 항구토제가 투여가 된 점은 구역·구토의 해소가 적절히 이루어지지 않은 이유 중의 하나 일 것으로 생각된다. 계열을 중첩하여 사용하는 것 외에도 NCCN 가이드라인에서 제시하는 규칙적인 처방이 아닌 증상 호소 시 마다 투여가 되는 경우가 대부분이어서 구역·구토 조절이 잘 되지 않은 것으로 생각된다. 뿐만 아니라 조혈모세포 이식 환자들은 이식이 가능한 환자 상태로 performance status가 대부분 좋고 65세 이상의 환자는 이식이 권장되지 않기 때문에 고령 환자의 비율도 일반적인 혈액암 항암 치료 환자보다 적지만 conditioning regimen이 수 일 간 지속되어 돌발성 구역·구토를 더 많이 일으키는 것으로 판단 된다. 특히 본 연구에서 구역·구토가 발생한 환자의 구역·구토 중등도를 평가한 결과 63.2% (55명/87명)가 conditioning regimen 기간 중에 하루 이상 CTCAE18)의 grade로 구역 grade 3 이상 또는 구토 grade 2 이상에 포함되어 구역·구토의 중증도가 높아 치료가 쉽지 않았던 것으로 판단된다. 본 연구의 한계로는 수 일에 걸쳐 연속적으로 항암제가 투여되는 conditioning regimen의 특성상 돌발성 구역·구토를 다른 종류의 구역·구토(예, 예기성 구역·구토)와 명확하게 구분하는 것이 현실적으로 어렵다는 점이다. 이에 따라 conditioning regimen에 들어가기 전부터 구역·구토가 있었던 환자는 대상 환자에서 제외하여 예기성 구역·구토를 최대한 배제하도록 하였다. 또한 돌발성 구역·구토의 치료를 위하여 항구토제의 규칙적인 추가 투여를 추천하지만 본 연구에서는 이에 대해 평가하지 못하였다는 점도 한계로 들 수 있다. 하지만 조혈모세포 이식 환자들에게 있어서 돌발성 구역·구토에 초점을 맞춘 약사 중심의 국내 연구가 미흡하다는 점과 예방적 항구토제와의 빈번한 계열 중첩 여부를 확인하였다는 점에서는 의의가 있겠다. 환자 특성 및 질환에 따른 conditioning regimen이 점차 다양해지면서 이와 관련된 supportive care 약제 또한 다양해지고 있어 상황에 따른 약제의 적절성 및 부작용 등을 살피고 관리하는 약사의 역할이 커지고 있다. 미국의 경우 각 의료기관 마다 항암제 투여로 유발되는 구역·구토에 대하여 예방적 항구토제의 사용과 돌발성 구역·구토 치료에 대한 기관별 프로토콜을 Pharmacy & Therapeutics Committee를 통해 개발하여 이를 준수하도록 하고 있고 이러한 프로토콜을 통해 임상 약사는 적절한 항구토제 요법을 투여되는 항암제에 따라 그리고 환자 개별적인 요소에 따라 적절하게 추천 할 수 있다. 또한 임상 약사는 돌발성 구역·구토에 대한 치료 약물을 의사의 처방없이 환자에게 투여가 가능하도록 할 수 있어 시기 적절하게 표준화된 치료가 가능하도록 되어 있다.19) 환자의 구역·구토와 같은 supportive care에 대한 약사의 관심이 환자의 삶의 질 측면에서 중요할 것으로 생각되며 본 연구 결과를 바탕으로 조혈모이식 환자들의 돌발성 구역·구토의 효과적인 조절을 위한 적절한 항구토제의 선택과 관련된 더 많은 후속 연구가 필요할 것으로 보인다. 본 연구에서 본원의 조혈모세포 이식 환자들의 돌발성 구역·구토에 따른 항구토제 사용 현황을 파악과 치료 적절성을 평가한 결과, 79.8%의 환자에게서 돌발성 구역·구토가 발생하여 추가적인 항구토제가 필요했으며, 필요시 투여 가능한 처방(PRN 오더)은 모든 환자에게 발행되어 있었으나 실제 호소 당일에 환자에게 PRN 오더가 투약된 빈도는 68.8%에 그쳤다. 또한 본 연구에서 2종 이상의 항구토제를 사용하는 경우가 약 59.7%, serotonin antagonist 계열의 예방적 항구토제와 같은 계열로 항구토제를 중복하여 처방한 비율은 38.0%에 해당하였다. 투약 후 구역·구토가 해소된 환자는 약 10.3%였다. 이에 따라 돌발성 구역·구토가 발생하여 항구토 치료가 필요한 모든 환자에게 약물이 투여 될 수 있도록 PRN 오더가 실제로 투약되는 빈도가 현행보다 더 높아져야 하며 NCCN 가이드라인에서 추천하는 바에 따라 같은 계열의 항구토제 보다는 다른 계열의 항구토제(예, atypical antipsychotic계열의 olanzapine, benzodiazepine계열의 lorazepam 등)의 투여가 적극적으로 고려되어야 할 것이다. Bliss JM, Robertson B, and Selby PJ. The impact of nausea and vomiting upon quality of life measures. Br J Cancer Suppl 1992;19:S14-22. Fox-Geiman MP, Fisher SG, and Kiley K et al. Double-blind comparative trial of oral ondansetron versus oral granisetron versus IV ondansetron in the prevention of nausea and vomiting associated with highly emetogenic preparative regimens prior to stem cell transplantation. Biol Blood Marrow Transplant 2001;7:596-603. Kamakshi R, and Aimee F. Chemotherapy-Induced Nausea and Vomiting:Optimizing Prevention and Management. Am Health Drug Benefits 2012;5:232-40. Navari RM. Treatment of Breakthrough and Refractory Chemotherapy-Induced Nausea and Vomiting. Biomed Res Int 2015;2015:595894. Fernandez-Ortega P, Caloto MT, and Chirveches E. Chemotherapyinduced nausea and vomiting in clinical practice:impact on patients&apos;quality of life. Support Care Cancer 2012;20:3141-8. Aapro M, Molassiotis A, and Dicato M et al. The effect of guideline-consistent antiemetic therapy on chemotherapy-induced nausea and vomiting (CINV):the Pan European Emesis Registry (PEER). Ann Oncol 2012;23:1986-92. Manal Z, Lana Sa, and Hafeez M et al. Assessing prescribing patterns for the prevention of chemotherapy-induced nausea and vomiting in the national center for cancer care and research. Saudi Pharm J 2015;23:381-7. Karin J, Christo S, and Hans-Joachim S. Guidelines for Antiemetic Treatment of Chemotherapy-Induced Nausea and Vomiting:Past, Present, and Future Recommendations. The Oncologist 2007;12:1143-50. Boccia RV, Clark G, and Howell JD. Use of transdermal and intravenous granisetron and the ability of the Hesketh score to assess nausea and vomiting induced by multiday chemotherapy. Cancer Manag Res 2012;4:171-6. Lee HJ, Kim YS, and Park I. Calculation of sample size in clinical trials. Clinics in Shoulder and Elbow 2013;6:53-7. Navari RM, Nagy CK, and Gray SE. The use of olanzapine versus metoclopramide for the treatment of breakthrough chemotherapy-induced nausea and vomiting in patients receiving highly emetogenic chemotherapy. Support Care Cancer 2013;21:1655-63. Seher A. Prevention of Chemotherapy-Induced Nausea and Vomiting. US Pharm 2014;39:7-11. Tuca A. Use of granisetron transdermal system in the prevention of chemotherapy induced nausea and vomiting:a review. Cancer Manag Res 2010;2:1-12. Tamura K, Aiba K, and Saeki T et al. Breakthrough chemotherapy-induced nausea and vomiting:report of a nationwide survey by the CINV Study Group of Japan. Int J Clin Oncol 2017;22:405-12. Grunberg S, Deuson R, and Mavros P et al. Incidence of chemotherapyinduced nausea and emesis after modern antiemetics. Cancer 2004;100:2261-8.